This cheerful Noah's Ark handpainted Christmas ornament will light up your tree and be a wonderful addition to your holiday decorations. 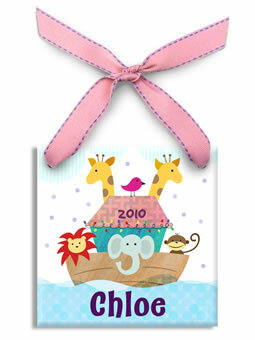 Handpainted with a charming ark scene and with colorful accents, this will be perfect for a young girl. Each tile is finished at the top with a coordinating pink ribbon for hanging. Personalized with your child's first name and year, each ornament is heat sealed using original artwork. Makes a wonderful keepsake.